If you're looking for fairy calendars or books, you've come to the right section! 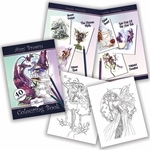 We have a wide assortment of lovely coffee table books, journals and calendars with pixies, witches, and other fantastic creatures. Fantasy artwork by a variety of talented artists, including Amy Brown, Jessica Galbreth, and Sheila Wolk fill these gorgeous items!